After starting the 2019 PGA Tour Champions season with a victory by Exotics staff player Tom Lehman in Hawaii, Tour Edge continued its now year-long hot streak this week with a Top 5 finish and four Top 10 finishes at the Oasis Championship in Boca Raton, Fla. This week was the first PGA Tour Champions event that the new Exotics CBX 119 metalwoods were introduced to the professionals on the driving range during the practice days prior to the event. 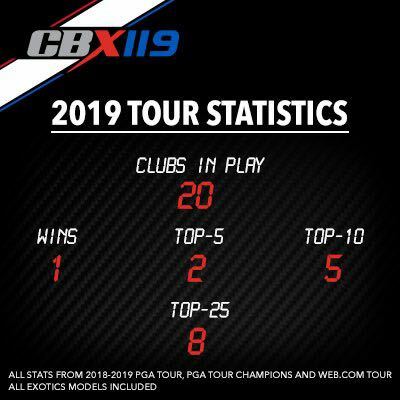 Over 80% of the metalwoods in play at the Oasis Championship for Tour Edge ended up being the brand new Exotics CBX 119 this week. Tour Edge Exotics staff player Scott McCarron, who now wears a Tour Edge Exotics logo on his sleeve, finished 5th at 11-under-par. He fired a 67 at The Old Course at Broken Sound golf course Sunday to move up from 13th to 5th place. McCarron was playing an18-degree Exotics CBX 119 hybrid in a Project X Even Flow Black X shaft, the same shaft that is available to consumers as a stock offering in the CBX 119 line. Two players finished tied for 8th at 10-under-par for the event playing new Exotics CBX 119 metalwoods. One T8 finisher is a player who won with Tour Edge in his bag last season at the PURE Insurance Championship at Pebble Beach. He was fit into the new CBX 119 15-degree 3-wood this week on the practice range in Boca Raton. The other T8 finisher is a new player to Tour Edge is a 15-time PGA TOUR winner and a former Masters winner. He put a 20-degree CBX 119 hybrid into play with a Project X Even Flow Black X shaft. Tour Edge Exotics staffer Tim Petrovic finished T10 playing his trusty #2 Exotics CBX Iron-Wood that he loves off the tee and with a new Exotics CBX 119 5-wood in the bag. Lehman also played the same CBX 119 hybrid and CBX Iron-Wood that he won with in Hawaii. The #2 Exotics CBX Iron-Wood was fit with a Project X Even Flow Black X shaft this week. He finished 19th at 7-under-par on the event and now sits 2nd in the official 2019 Charles Schwab Cup money standings. Thirteen total Exotics clubs were in play this week in Boca Raton, according to the Darrell Survey. The Tour Edge clubs in play include seven hybrids, four fairways and two utility irons. Of the 11 metalwoods in play this week, nine were the brand new CBX 119. In 1986, David Glod founded Tour Edge with a focus on offering golfers with high quality and technologically advanced golf products that were as cutting edge as they were affordable. He is now considered one of the preeminent master club designers in golf club design and has led Tour Edge to be a Top 10 manufacturer in every club category. Tour Edge, an American owned and operated company for more than 33 years, manufactures and sells golf clubs under three distinct brand names: Exotics, Hot Launch and Bazooka. Exotics products bring futuristic technologies to the marketplace with tour preferred designs and smaller production runs. Exotics clubs utilize higher-grade, avant-garde materials and manufacturing methods that have established Exotics as a leader in quality craftsmanship and to redefine what is possible in golf club performance. Hot Launch has forged a name for itself as a producer of high-quality premium game improvement golf clubs from driver to wedge. Hot Launch has proven to provide the greatest custom fit value in golf and includes an unprecedented guaranteed 48-hour custom fit delivery program. All Exotics and Hot Launch clubs are hand built in the United States in Batavia, Illinois and then distributed throughout the world. Every Tour Edge club comes with a Lifetime Warranty and a 30-day play guarantee.